The most severe red tide to hit Florida in more than a decade has left a trail of dead fish, sea turtles, manatees and other marine life along the state's southwest coast. In a letter to Senate Majority Leader Mitch McConnell on Wednesday, Everglades Foundation CEO Eric Eikenberg said Florida is depending on Congress for help funding a reservoir south of Lake Okeechobee. He urged McConnell to make the bill containing the reservoir project a top priority when the Senate returns from an August break. Scientists say building a water storage reservoir south of Lake Okeechobee would help reduce future algae blooms like the ones currently plaguing Florida's coasts and inland waterways. 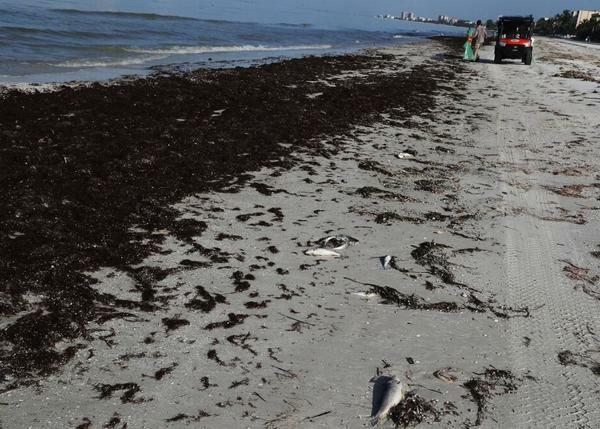 "Florida is being ravaged by a perennial algae crisis that is destroying our beaches, fisheries, real estate and tourism industries," Eikenberg wrote. "We are desperate for the relief afforded in this legislation." The U.S. House of Representatives has already approved a version of the bill with a placeholder for the reservoir. If the Senate version passes, the two versions will need to be reconciled before any final funding decisions are made. As in the summer of 2016, noxious-smelling blue-green algae in Lake Okeechobee and the St. Lucie and Caloosahatchee estuaries threatens the habitats of birds and fish, prompting a state of emergency declaration. On the state's west coast, a “red tide” of algae has killed manatees, sea turtles and thousands of fish. Both types of bloom have been linked to respiratory irritation and other symptoms in humans. The blooms are fueled in part by nutrient-heavy water that’s discharged east and west from Lake Okeechobee when there’s a lot of rain. A reservoir south of the lake would provide extra storage and reduce the need for discharges.